Green as can be, Miki Sayaka has just taken up the mysterious cat-like being Kyuubey’s contract and has become a Magical Girl under the guidance of her upperclassman Tomoe Mami. She’s stoked to have had her wish granted, and is eager to protect Mitakihara City like a classic cape-adorned super hero. Alongside her best friend Kaname Madoka, who has an interest in becoming a Magical Girl herself, Sayaka is juggling her personal and Witch fighting lives the best she can. The story in volume two focuses much less on Sakura Kyouko and Tomoe Mami, and in some ways retreads some of the ground which was already covered in the tv anime/first two films. This is disappointing, but it isn’t a complete game breaker, as interesting things are done there as well. Perhaps you know where things are going, but the journey from point A to B isn’t exactly as you remember it being. There are again a fair number of action scenes, and as was the case with the first volume, I had a little difficulty following these, though thankfully, you don’t really go into Madoka Magica for the action, and understanding the blow-by-blow action of these scenes isn’t all that necessary. It runs at ~160 pages, and same as with the first volume, I wish there were more time for character interaction and narrative building. What’s there was enough to stave off my hunger for a new Madoka fix, but it didn’t quite leaving me full and satisfied. Here’s hoping the final volume brings it all together in an interesting way and offers a memorable conclusion! 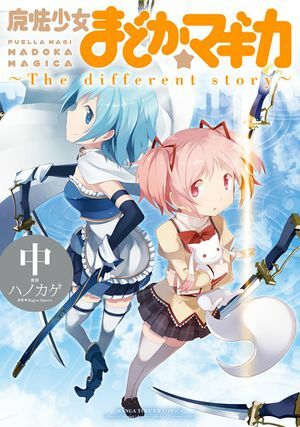 The focus on characters and events already covered in the tv anime/first two films makes Madoka Magica: The Different Story vol. 2 less interesting than the volume which preceded it, but admirable things are done with the existing narrative to make it worth the read nonetheless.